Stock# - pi01010tgs Special Occasions require special invitations. 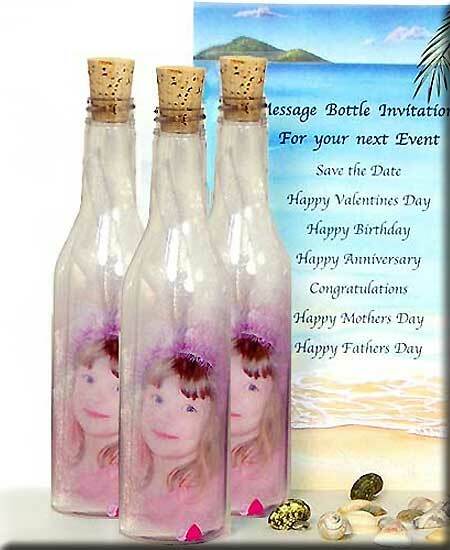 - Now you can truly customize your Message in a Bottle Invitations with your own Photo in a Bottle. Create an illusion of a transparent image in a soft and subtle way to preserve that moment in time. 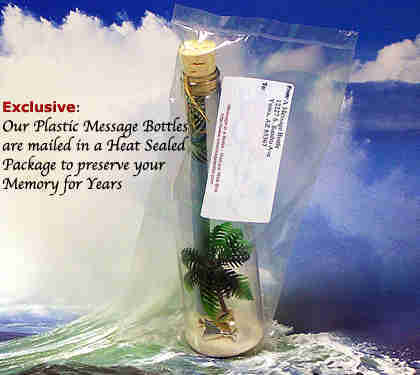 Your photo will be safely inserted in the bottle! This is one invitation that will never be forgotten and will be a treasured gift for the Bride and Groom, a New Baby announcement or family photo for a Christmas greeting. 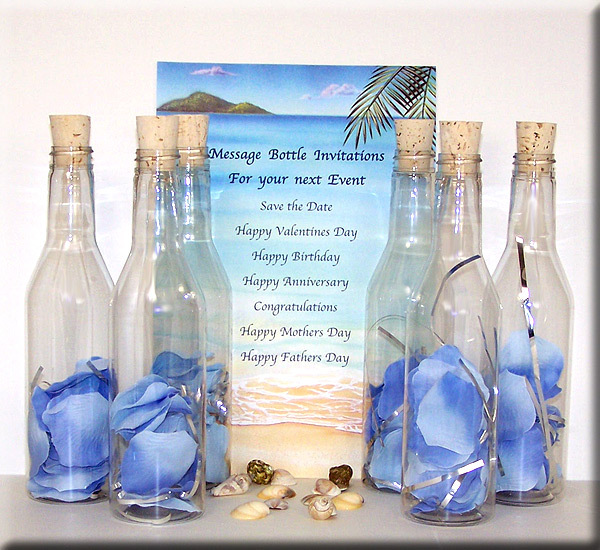 We have created the Ultimate Message in a Bottle Invitation starting way back in 2005. 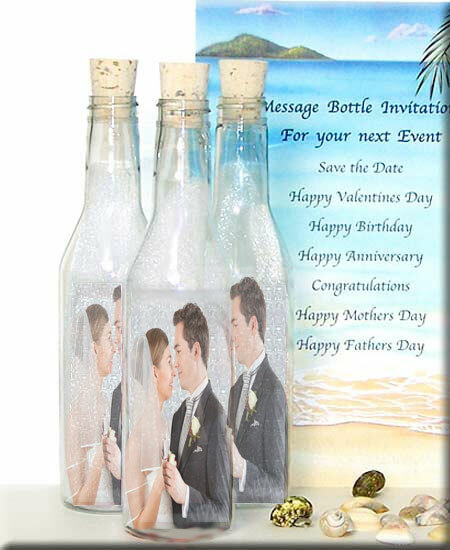 There has been no better way until now to make an Announcement and or Promotional idea with a personalized greeting printed on a scroll and inserted into our Exclusive Photo Message in a Bottle greeting. Price shown is based on a Minimum order of 12 or more. Additional Discounts are applied automatically at Check Out, (See the link below for further Discount details). Please allow 10 business days for assembly. Fill In the Form Below To Place Your Order With Options. Once you viewed the scrolls, select the desired scroll style from the Drop Down above. Order Today and indicate above the Date you want your order Mailed OUT. First-Class Mail (Selected), Add $1.20 for delivery tracking. 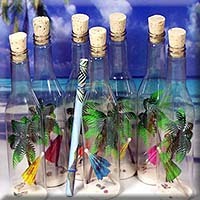 This Message in a Bottle Also Appears In Categories Below. 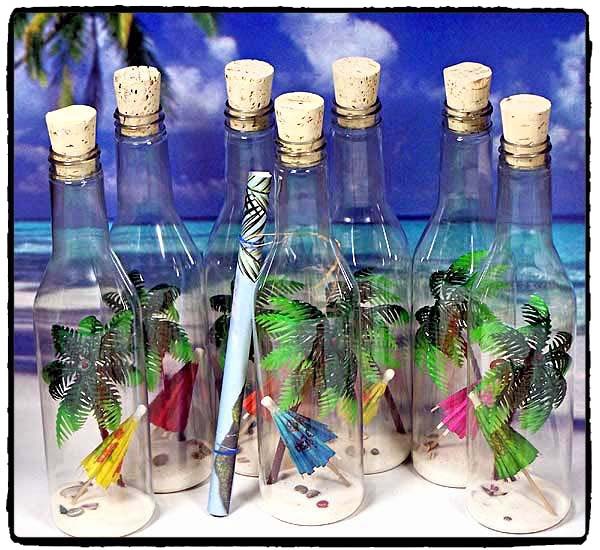 Stock# - pi0130tgs Exclusive: Plastic Message in a Bottle Invitations - Send a unique invitation with a Tropical theme for the Beach Lover in all of us. 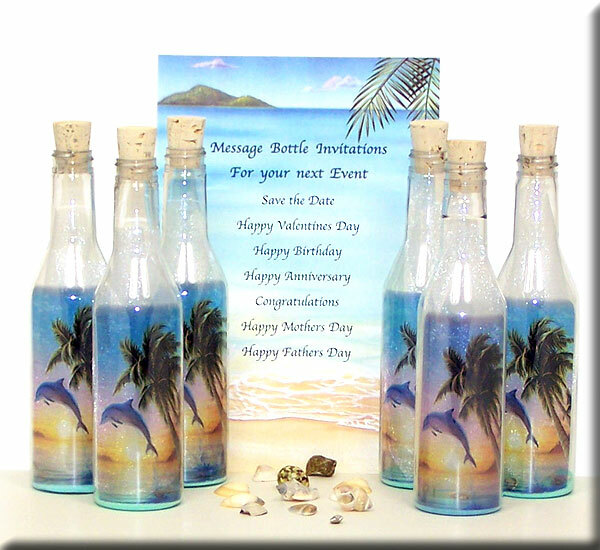 Our Beach Bottle Invitation complete with (Palm Tree, Umbrella, colored simulated Sand and Sea Shells) is ideal for many occasions, Weddings, Anniversaries, Birthdays, Retirement and many others. 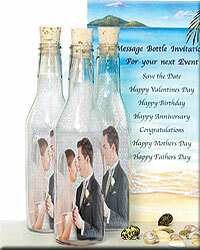 Give your Guests a Memory and a Keepsake from your special occasion. 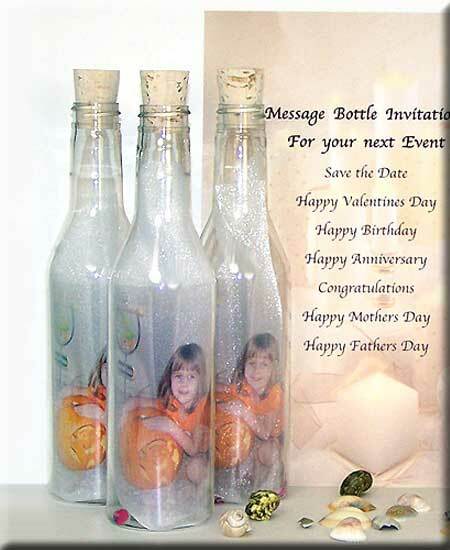 Description: Handcrafted designer plastic Message in a Bottle (as shown) with your personalized invitation imprinted on the scroll. Please select scrolls without borders for plastic bottles only. Note: When ordering invitations you are able to add the complete mailing information for each Guest in our Check Out page (where you fill in your billing information). Once you fill in the billing information click the check box ( ) , to remove the check mark and a complete list of all your Invitations will be shown and listed separately. Fill in all the information for each guest and we will mail all your invitations on the date you selected. If you would rather email us your guests mailing information please Contact us after you have placed your order and we will be happy to assist you. 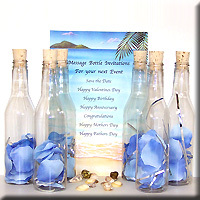 Stock# - pi01306tgs Plastic Message in a Bottle featuring Blue Pastel Petals - Simple but elegant drop in the mail clear plastic message in a bottle greeting. Great for any occasion and at a very affordable price. 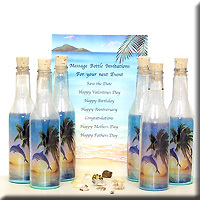 Stock# - pi01301tgs Plastic Message in a Bottle Diving Dolphins - Simple but elegant drop in the mail clear plastic message in a bottle featuring a dolphin diving with a sun set beach back drop. Great for any and all invitational functions, be it a bridal shower, wedding invitations or anniversary party, all at a very affordable price.